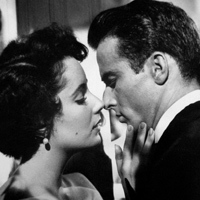 Before World War II, director George Stevens made elegant comedies like Woman of the Year and The More the Merrier, and after the war, when he had filmed the concentration camps and was profoundly shaken by it, he made stately dramas like Shane and Giant. This story of a young man trying to make his way up through an American class system that America isn’t supposed to have might have seemed like social realism to Stevens at some point, based as it was on Theodore Dreiser’s An American Tragedy, but it’s an anomaly in Stevens’s work, the most dreamlike film he made and one of the most dreamlike movies since Sunrise (Essential Movie Library #24), to which it bears some narrative and thematic similarities. It calls on us to overcome the ethical absurdity at the movie’s heart, that someone is guilty of committing a murder just for having contemplated it; the closest thing to a rational argument is that in its contemplation, murder was set in motion. None of this matters, nor does it matter whether Stevens understood his own film, which is dubious. By savvy or luck A Place in the Sun becomes a movie of mounting delirium verging on quiet hysteria, shot with shimmer by cinematographer William C. Mellor, scored with rapture by Franz Waxman, and starring Elizabeth Taylor and Montgomery Clift, as beautiful as any two people ever on a movie screen, who could be staring at each other from opposite sides of some mirror that knows no gender, with a chemistry between them that’s beyond desire. Previous articleFoam Finger: Has Vintage Josh Beckett Returned?